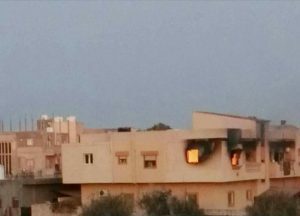 Fighting in Sabratha between the 48th Brigade along with its allies and the rival Anti-ISIS Operations Room (AIOR) intensified today after efforts yesterday by elders from Zawia and Zintan to broker a ceasefire collapsed. Both sides have blamed the other for the failure of the ceasefire, with each demanding that the other withdraw. According to the Sabratha media centre, AIOR demanded that the 48th brigade withdraw to its headquarters and allow the national security directorate to take over the town centre. AIOR, however, is reported to have adamantly refused the same withdrawal request from the mediators. Instead it has accused the brigade of being allied to militants and being involved in people smuggling. Its latest statement was that it would secure the town itself. During the day there were fresh attempts to mediate a new truce but this came against the background of bitter clashes in the centre of the town, included random rocket fire. According to Sabratha hospital, which says it is operating as best it can in the situation, it has received seven dead and 25 wounded since the clashes started five days ago. In response to the situation, UNSMIL has called for an immediate end to hostilities and for the protection of civilians in accordance with international humanitarian law. The head of Sabratha military council, however, has called on UNSMIL and other international organisations to step in and help move illegal immigrants from local detention centres. For its part, the Red Crescent, which has evacuated a number of families from the town centre, has called for a safe corridor to be set up to allow others to leave. The Libyan National Army’s western operations room has meanwhile come out in support of AIOR claiming that it is a unit of the LNA and that it is fighting the Muslim Brotherhood. There are reports today that the LNA is mobilising forces in the area ahead of possible action in Sabratha.